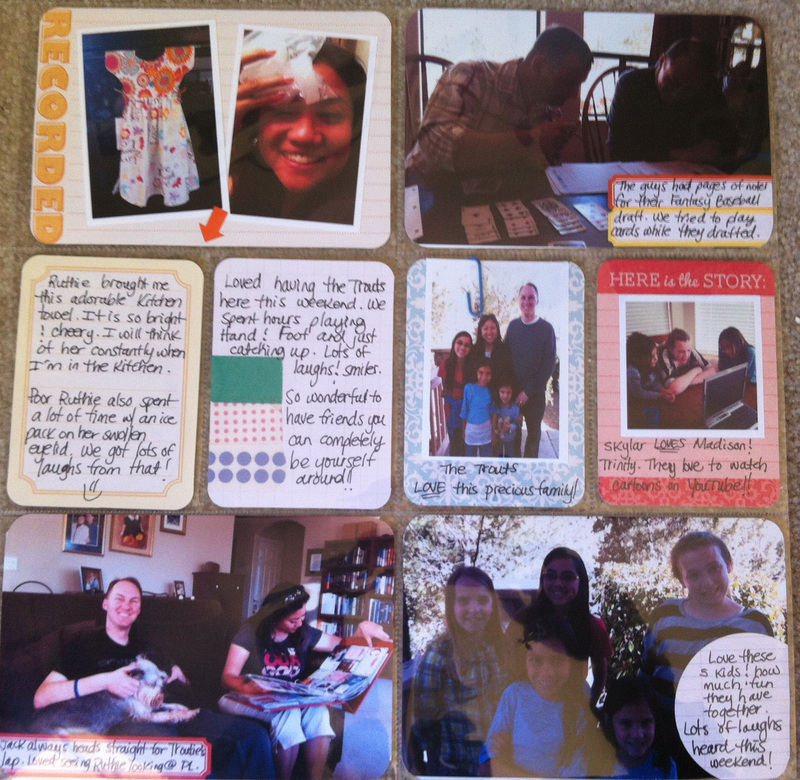 Project Life: Week 13 | I am JuJu! ← Not Only Awareness, but Understanding and Acceptance! Lucky number 13! Can’t believe it is already April! 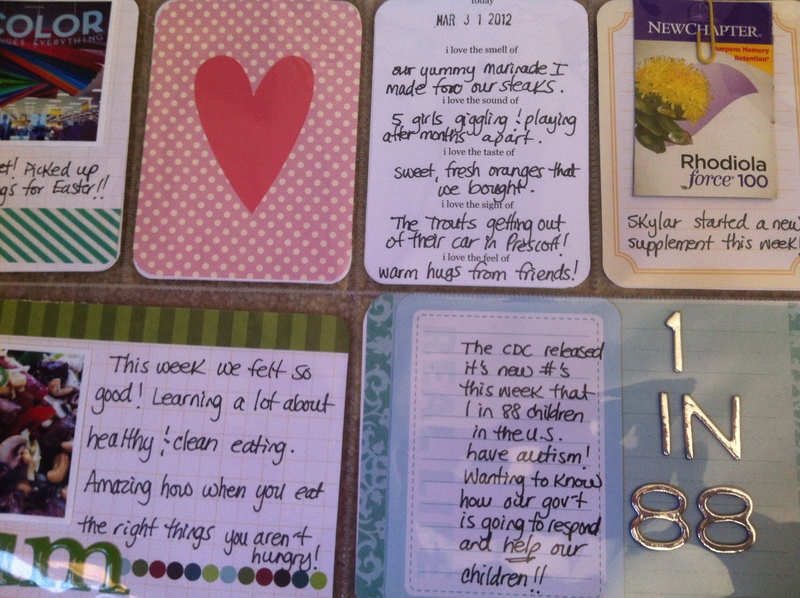 April is going to be a big month here on the blog as it is Autism Awareness Month. Make sure you check back for great information and giveaways this month. You can read my post from yesterday here. If you don’t want to miss anything, you can subscribe to my blog in the upper right hand corner. You enter your e-mail & it shoots you a message whenever I post. Simple as that. So onto my pages for the week. I’m still loving this way of documenting our every day. I kept it pretty simple again this week and I love the freedom in that! Below is a shot of my entire layout. If you have been to my blog more than once, you know that I love to add splashes of color throughout my layouts. Below is the left page. The pink polka-dotted card with the heart is another card from this set that I downloaded a month ago. Kristina & Crystal made such a great & versatile set. Some of our best friends from New Mexico came for a visit this past weekend. The entire right hand page is devoted to that visit. We played lots of cards and had tons of laughs. We are so thankful for great friends that love us & our girls. Here is a close-up of the left-hand page. I used another one of the journals from Marta Writes. 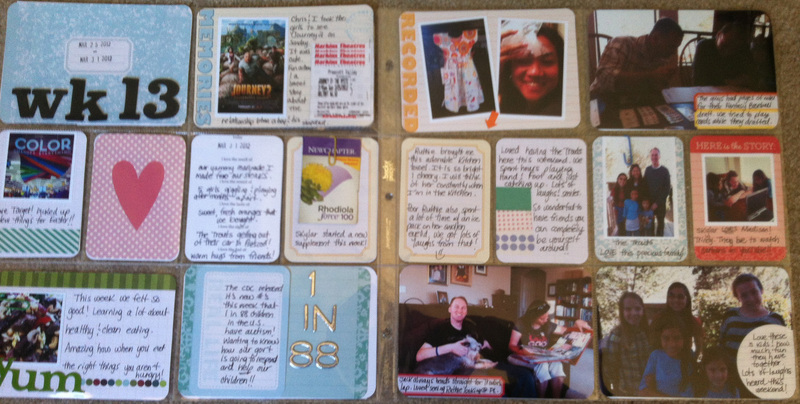 I love that they are quick & easy to fill in and I love that it adds a great glimpse into my life right at that moment. I also added the statistic from the CDC that came out last week. They said that 1 in 88 children have autism in the United States. That’s a lot of children & families affected by autism. I loved the picture below of my friend Ruthie sitting on the couch looking through my project life album. Well there you have it. A pretty simple layout of a great week! I’m already looking forward to next week and capturing all of our Easter festivities. Even though Easter is Sunday, I will be including that in next week’s layout as my family will be here this weekend to celebrate. I don’t stress out about adding an extra day in. Another lovely thing about project life! I am linking up as always to The Mom Creative and One Happy Mama. Head over and check out some really great project life inspiration. I love the people I have met through these link-ups. This entry was tagged documenting the everyday, project life week 13. Bookmark the permalink. Great pages Julie – love the way you’ve used the colour of the heart card with the aqua. Looks fabulous! Autism is the endorsement that I’m working on right now. It’s always fun to have visitors, glad you had such a lovely time with your friends! Your reference to NM made me think of our two years living there. I miss the blue skies. I have been hearing a lot about Autism lately, Toni Braxton has a radio commercial in which she gives a lot of statistics about how unlikely it is to become a star singer like her but how likely it is you will be or have been touched by autism. Great pages this week, full of color and warm memories. Love how much journaling you have and you work all the pictures in to the week. I love your pages! I am a simple type of Project Lifer too! I like your style 😉 Thank you for sharing! Keeping it simple is what Project LIfe is all about, that is so totally why I love it too! 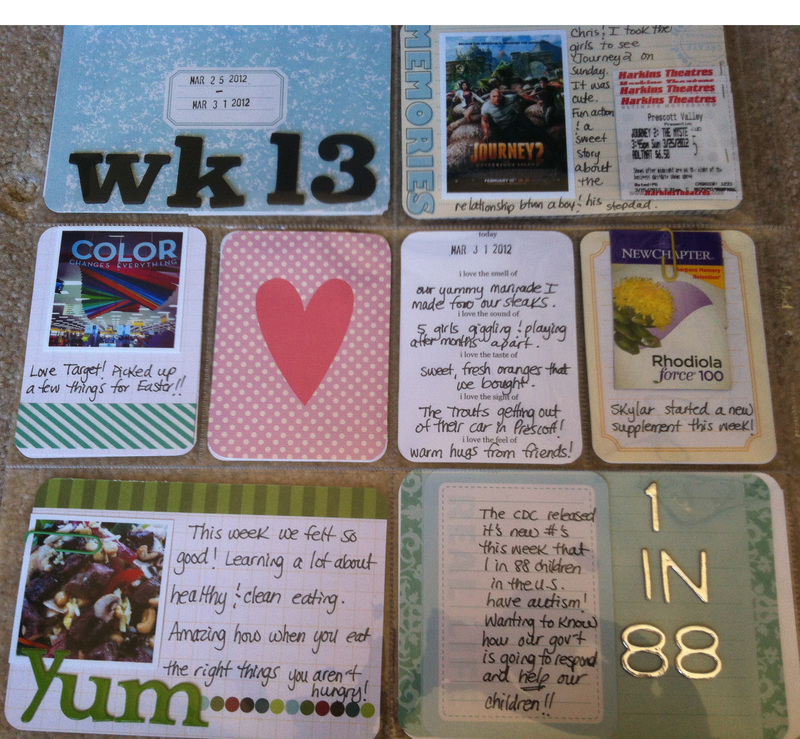 I love your extra journaling cards. Great layout! April is a crazy busy month! I think it is worse than December! Good luck and happy Easter! great layouts, Glad you had a great visit, time with friends is so important!! Fab pages as always Julie, and that photo of your friend looking through Pl is a great reminder of why we do this – so good to be able to document the pieces of our everyday to share and look back on. I can’t wait to see your Easter pages next week! 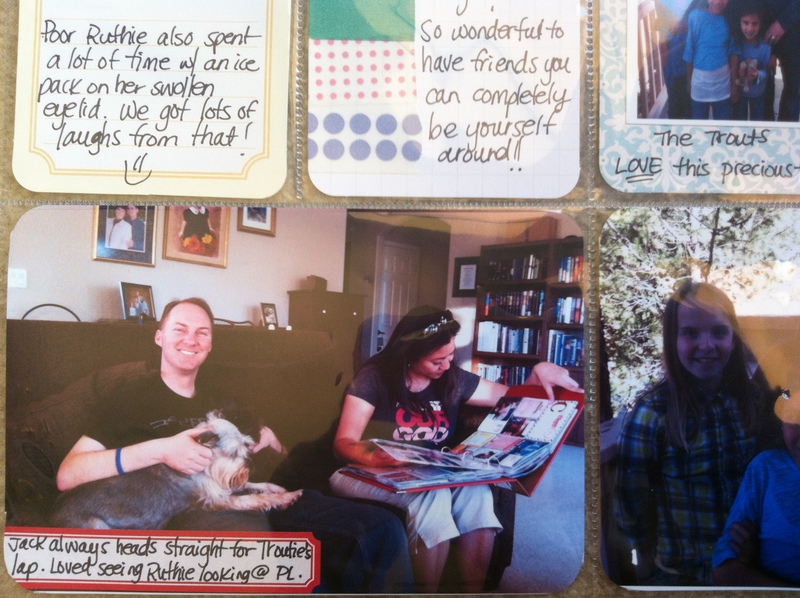 love the photo of your friend peaking through your album, that’s perfect, and what it’s all about! the centered heart on a journal card is awesome. Really lovely pages! I especially like the little questionnaire card.